This bundle includes three of Audionamix's leading products VVC, IDC and Trax based on their ground-breaking ADX technology that can separate both musical instruments and melodic voices from typical mono or stereo music recordings. This ADX technology has proven to be an invaluable component when solving complex audio problems. The ADX Vocal Volume Control (VVC) plug-in is a one-of-a-kind solution for controlling volume level and pan position of a lead vocal within a mono or stereo final master mix, without requiring the original multitrack stems. The IDC plug-in is the first realtime, cloudless solution from Audionamix. 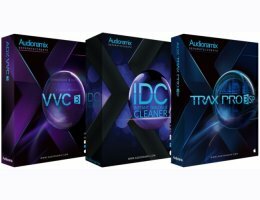 Available in VST, AU, AAX Native and AudioSuite formats, IDC offers unique and effective dialogue cleaning technology through an intuitive interface, compatible with many workflows. Unlike traditional de-noisers that learn and remove noise, IDC works by separating and preserving your speech, regardless of the interference. It therefore works when other tools cannot, such as with wind, roomy files and complex, varying background noise (birds, insects, car and plane bys, music, random sonic environments). TRAX Pro SP introduces a speech-optimized separation algorithm which automatically detects and separates speech, allowing you to extract or remove dialogue from background elements. TRAX Pro SP also includes a new automatic consonants detection feature to help maintain the clarity of the separated voice. Audionamix have also expanded the lower pitch range on separations to improve the performance of the software on deeper voices. - Create vocal and/or instrumental riffs to drop into a mix. - Create music beds from well know songs to mashup and mix up. - Create contemporary and artistic remixes and mashups using any vocal and/or instrumental. - To clean up a recording that may have mic bleed from other instruments into the vocal track. - Add volume to a vocal that was mixed and mastered too low. - Add effects and processing to a vocal or solo instrument that is already mixed without need of separate stems.